Poultry processing plants have historically developed close to markets and labour sources, with many of the largest operations within 100km of a capital city. This keeps distribution and transport costs down and ensures labour and other services are available. However, over the past ten years we have witnessed more growth of the industry in regional areas, for example, around Griffith and Tamworth in NSW and regional SA. locations where biosecurity risks are more manageable. Northern Territory – no commercial meat farms. Figures for SA, WA and Tasmania are not published by the ABS to protect commercial confidentiality. Production data for these three states are a combined total across all three states. Note: The actual figures relating to a specific sector of the pie chart above appear when the mouse hovers over it. Breeding farms (which hold the Great Grandparents, the Grandparents and Parents of the meat chickens grown for human consumption) are strategically located across Australia, with Great Grandparent (GGP) and Grandparent (GP) breeder farms currently located in South Australia and NSW. These GGP and GP farms tend to be sited in areas more isolated from the traditional poultry rearing areas. This is to reduce the risk of these valuable flocks being exposed to disease agents. Hatcheries are often located close to major chicken growing areas. Most feed is supplied from mills owned and operated by the vertically integrated chicken companies. The remainder is supplied by commercial feed mills, formulating diets to the nutritional specifications determined by the chicken companies. The location of company feed mills is driven largely by transport costs, so most major feed mills are close to significant areas of chicken farming – although access to feed ingredients, particularly sources of grain, is also a factor. Chicken primary processing plants (abattoirs) are located centrally to where the chickens are grown. Ideally, they are located within 200km of the chicken farms that supply them, in order to minimise the amount of time that chickens need to be in transit from the farm to the plant. 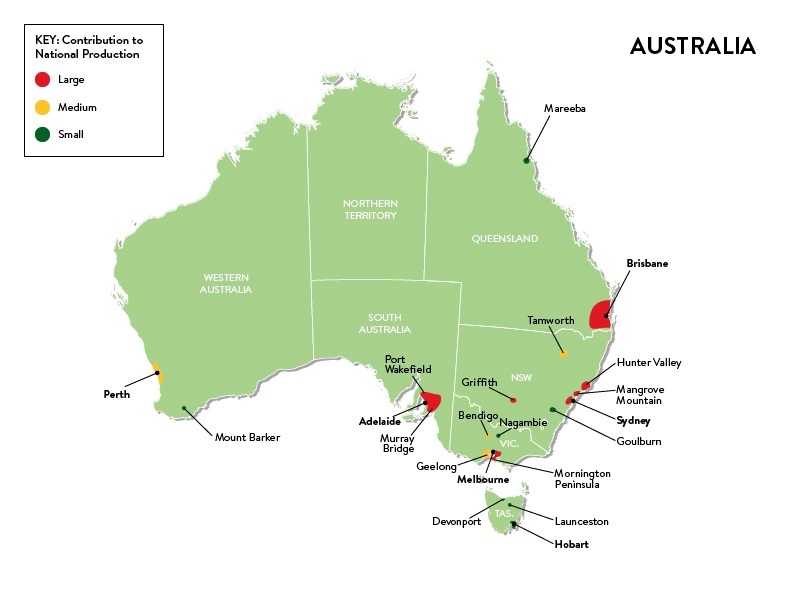 Therefore, the location of processing plants roughly parallels the map shown above, with plants located near Mareeba, Brisbane and nearby south east Queensland centres, Tamworth, Hunter Valley (NSW), outer metropolitan Sydney, Griffith, Melbourne (northern suburbs, Mornington Peninsula, Geelong), Bendigo, Adelaide, Perth and Hobart. The chicken meat industry is predominantly vertically integrated. This means that individual companies own almost all aspects of chicken production – parent breeding farms, hatcheries, feed mills, processing plants and, sometimes, meat chicken rearing farms. In this respect, the chicken industry is quite different from most other rural industries, which typically operate through a more complex supply chain. However, these days, this vertical integration doesn’t extend right back to the level of the poultry genetics. Indeed, today, there are two breeding companies who import new genetic stocks as fertile hatching eggs which are hatched to become the Great Grandparent (GGP)s of the chickens that are ultimately grown for production of chicken meat. These companies typically import a couple of batches of new genetics each year. Two companies maintain Great Grandparent (GGP) and Grandparent (GP) breeding flocks in South Australia and NSW. Most of the vertically integrated chicken companies, particularly the large and medium-sized companies, obtain their parent (PS) stock as day-old chicks from these two breeding companies. Fertile hatching eggs from these parent flocks are then hatched by the integrated chicken companies to be reared and processed for chicken meat. Some other companies purchase day-old meat chickens from other integrated chicken companies to rear from day old to processing; yet other companies buy fertile meat chicken eggs from one of the other companies and hatch them out in their own hatcheries before rearing them to processing. The two largest integrated chicken companies – Baiada Poultry and Inghams Enterprises – supply approximately 70% of Australia’s meat chickens. Inghams Enterprises is a publicly owned company, and Baiada is privately owned. These two large companies have their headquarters in NSW, but have chicken production and processing operations in four and five states respectively. The balance of the market is supplied by another four medium-sized, privately owned integrated companies, which each supply between approximately 3% and 9% of the national market. One of these companies (Cordina Chicken Farms) is located in the Sydney Basin / NSW Central Coast / Hunter region of NSW. Two other companies are based in Victoria – Turosi, based in Thomastown (Melbourne) and Geelong, and Hazeldene’s Chickens based in the Bendigo area. In Queensland, Golden Cockerel has its operations based around Mt Cotton. A myriad of smaller processors, several of which are integrated to some degree, make up the balance of production, totalling between 5-9% of total chicken production. Rearing of the meat chickens, from day old chicks to the day of processing, is generally contracted out by the integrated chicken processing companies to contract chicken farmers. Approximately 700 chicken farmers produce about 80% of Australia ’s meat chickens under these contracts. These farms might be owned by independent family farmers, or by corporate growers, the latter being companies which own a number of farms, each managed by a farm manager. Some integrated chicken processing companies contract out all of their chicken rearing to contract chicken farmers, whereas other processing companies use a combination of contract farmers and their own, company-owned farms to rear their meat chickens. Contract chicken farmers own the farm and provide the management, shedding, equipment, gas, power, labour, and a range of other inputs to rear chickens. The processing company provides (and owns) the chickens and provides feed, veterinary support and technical advice and arranges for the harvesting of the chickens. The fee paid by companies to contract chicken farmers for rearing their chickens may be negotiated directly by the company with individual farmers, or between the company and groups of farmers, under ACCC authorisation. To establish a new primary processing plant capable of handling a volume of 780,000 meat chickens per week would cost in excess of $200 million, including land and infrastructure. Fertile egg production facilities (breeder farms) required to produce 780,000 meat chickens per week would require an investment of the order of $60 million, while a modern hatchery complex would cost around $50 million, and a feedmill to produce the volume of feed necessary about $45 million. Meat chicken rearing farms needed to ensure a supply of 780,000 meat chickens per week would require an investment of some $170 million (equivalent to around 32 average farms with capacity for 240,000 chickens; see next dot point below). A farm comprising 6 sheds housing up to 240,000 meat chickens at any one time and producing a total of 1,320,000 birds a year across an average of 5.5 batches would cost somewhere between $5m – $7.5m, possibly averaging $5.4 million. All trade enquiries should be addressed to chicken meat processing companies directly. The ACMF does not have products for sale, nor can it assist with sales related matters.